This was the second game of two that we played on the same afternoon. Both very fast, but not very bloody. We used the same terrain as for the previous encounter, but with enough differences to ensure that we couldn't use all the weak/strong points that we'd found in the last game. 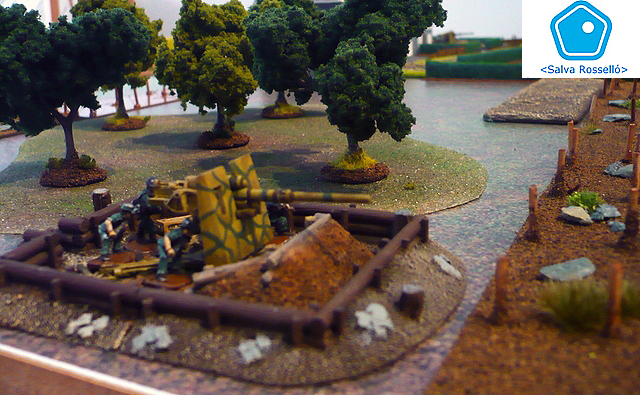 The Germans begin the game by deploying their artillery, more to scare their opponents than anything else. Everything else, for both sides, is hidden under Blinds. As soon as the game begins, the British think that they could gain the most advantage by combining their force and attacking a single point. Although this meant that the British could advance quickly in three spearheads, it didn't actually work as a tactic, as their armoured vehicles were easily picked off. As a result of their losses, the British did not advance beyond the wire, so the result was total victory for the Germans.